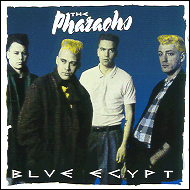 The Pharaohs were a British Psychobilly band from Harlow in Essex. Their vocalist and second guitarist, Glenn Daeche, wrote most of their songs. They were regulars at the Klub Foot and other low-life places in the Eighties. As one of the 'first generation' of Psychobilly bands, one can see that their roots were firmly embedded in Rockabilly. 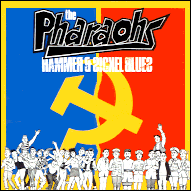 "Aside from some very cool British psychobilly tracks like an insane 'Wild Thing' (Troggs), 'Radar Love' (Golden Earring), 'Down The Line' (Roy Orbison) and a slab of rockin' originals, the Pharaohs cut a very cool surfabilly instro. Keep on running (Daeche) * Radar love (Kooymans/Hay) Sony/ATV Music Ltd.
from previous track on master. It is suggested that you join the above two tracks together to make the music play correctly.